Ocelot Phish Pin! Won't you come out to play? "2010" and sequential #'s 1-1000 on the back. 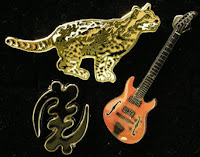 it comes with the Gye Nyame Pin and the Languedoc Pin.